A plan of the Grimsby area and its 'Ancient British Monuments', published as the frontispiece to Oliver's Monumental Antiquities of Great Grimsby in 1825; click for a larger version. Toote Hill and Cun Hu Hill, near Grimsby, as depicted on Smith's plan of 1825. 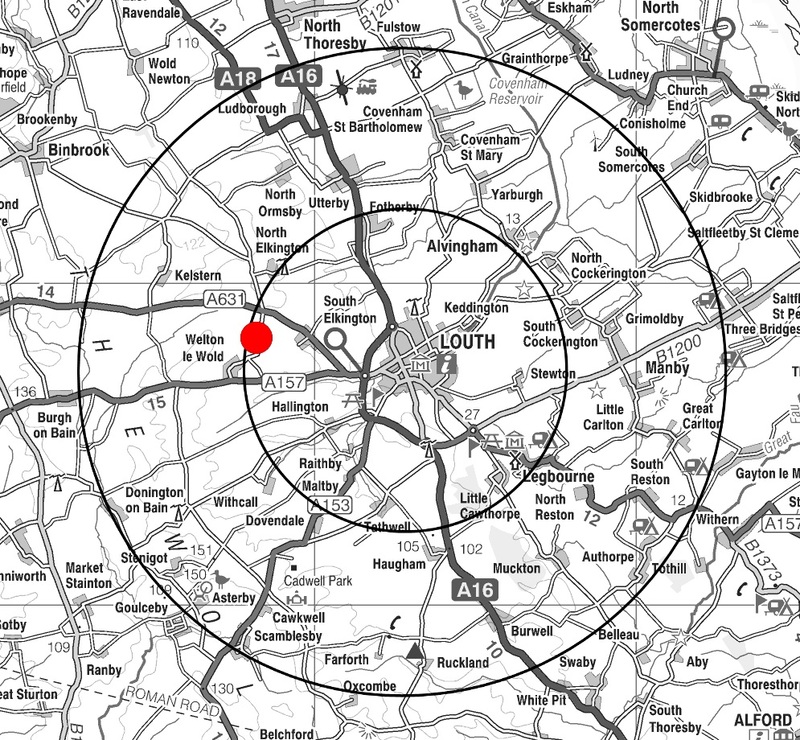 The plan is orientated so that south-west is where north would normally be. a huge mound with an irregular ground plan, but the upper portion has an elliptical contour. It is composed chiefly of sand and sandy clays, which seem to belong to the late Glacial Period. A sand pit which was being worked at the base of one side of the hill, yielded broken and comminuted specimens of Ostrea, Tellina, and other marine shells. Towards the summit, however, there were undoubted signs of man's work. A slight fall of snow had rendered discernible a shallow trench which encompassed the hill slope... A few small flint flakes were detected on a bare patch of turf. One suspects that this hill served both as a beacon and a watch-tower when the Humber and the North Sea were nearer the spot, and when Grimsby was represented by a string of islets lying amid the waters of a lagoon... Bones and earthenware were found at, or near, this spot a century ago, and soon after the visit just described skeletons were dug up in the sand pit. The ultimate fate of these skeletons, and their determinations, could not be ascertained. The destruction of Toote Hill. 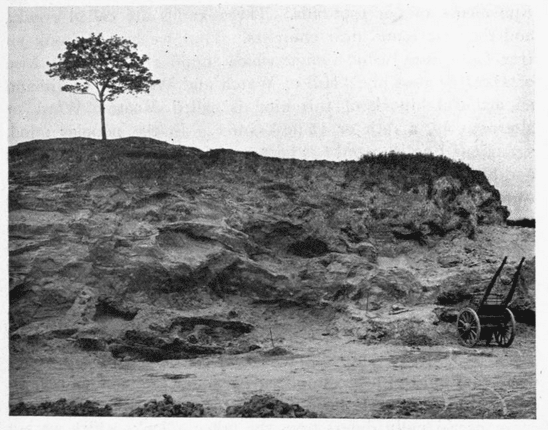 A photograph taken in 1903, showing the hill in the process of being quarried away (image from Walter Johnson's Byways in British Archaeology, 1912). Cun Hu Hill appears to be equally interesting, being represented on Smith's map as an oval earthen fortification with a ditch and rampart. This fortification has been discussed at length in 1995–6 by Barrie Cox, who identifies the name as probably consisting of a reduced form of Old Danish kunung, 'a king', combined either with a reflex of Scandinavian haugr, 'a burial mound, a hill'—which might fit with the depiction of a burial mound within Cun Hu Hill on Smith's map—or Old English hōh, a promontory, which would work topographically for the immediate vicinity of both Cun Hu Hill and Toote Hill in the early medieval era, this probably representing a promontory of dry ground stretching out into the early medieval coastal marshes (see map below). 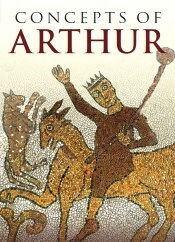 If the latter element of the name is indeed OE hōh, then this might in turn suggest that ODan kunung was a replacement for Old English cyning, 'a king', paralleling the situation seen at the various Conistons across England, with the name as a whole perhaps applying originally to the whole promontory and indicating some sort of pre-Viking, royal Mercian control over this, the Toote Hill, and the earthen fortification. 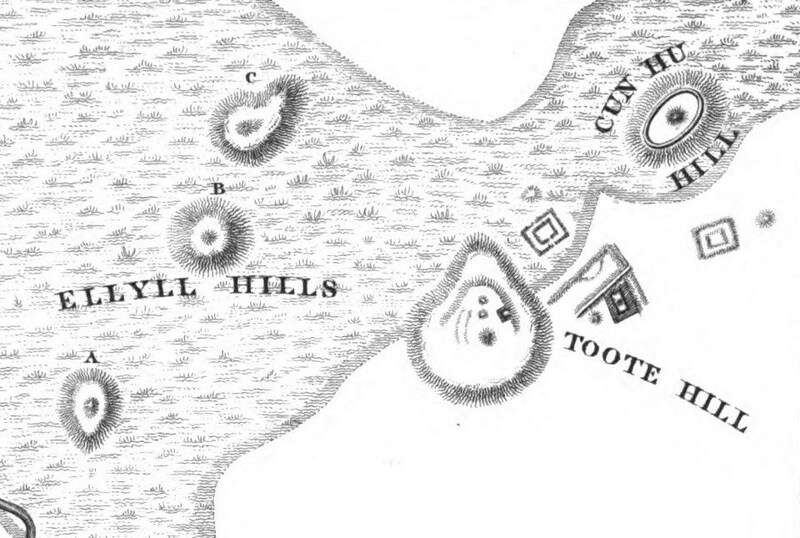 With regard to the pre-Viking-era name of the fort itself, Cox observes that the neighbouring district to the area of Cun Hu Hill—as determined from Smith's map and the still-surviving name 'Toot Hill'—is nowadays called Yarborough, as can be seen on the map below. 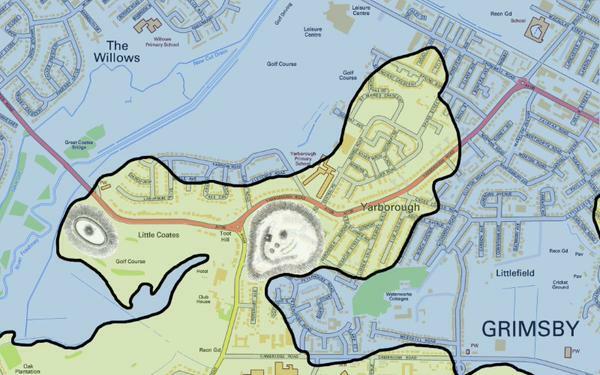 'Yarborough' derives from Old English eorð-burh, 'earthen fortification', a fortification-name and place-name that recurs several times within Lincolnshire and the East Midlands and refers specifically to pre-Anglo-Saxon earthen fortifications. In this light, Cox suggests that the presence of this district name close to the site of Cun Hu Hill may be more than a coincidence and that the modern district-name does not simply derive from the Earls of Yarborough, but instead preserves a memory of the original name of Cun Hu Hill. As to the shape and location of the fortification here, Cox visited its site in the 1990s, this now being part of Grimsby Golf Course. He reported that the heavy landscaping demands of the golf course had largely destroyed or obliterated the enclosing ramparts, but that he was able to still locate what he identified as the easterly bank and dry ditch of the Cun Hu fort in roughly the area that Smith's plan placed it in relation to Toote Hill (note, this feature also appears to be visible on the Environment Agency's Lidar survey of the area). However, Cox also observes that the line of the surviving rampart ran straight rather than curved, as it appears on Smith's very stylised plan, implying a rectilinear fortification rather than an oval one—perhaps originally similar, he suggests, to Yarborough Camp, which Kevin Leahy has argued was probably fortified/refortified in the fourth or fifth century AD. Cox indicates that he considers a very late Roman date may be appropriate for Cun Hu Hill too, with it and Yarborough Camp potentially both being part of the late Roman defensive arrangements for the Lincoln region. 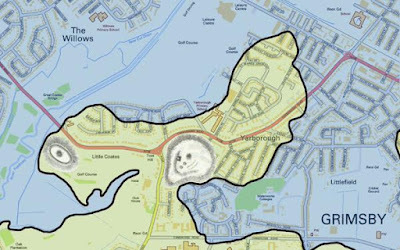 The suggested locations of Toote Hill and Cun Hu Hill against a modern street map of Grimsby/Little Coates, based on Barrie Cox's 1995–6 article; click the image to see a larger version. Also shown is the main 5m contour line for this area, adjusted to take account of the levelling of Toote Hill, with land below 5m OD tinted blue and that above tinted green; it should be noted here that eastern Lincolnshire saw a significant marine transgression in the late/post-Roman period—see my post on the Lincolnshire Marshes in the Anglo-Saxon period—and the 5m contour represents a reasonable approximation of the boundary between dry land and low-lying marshland/the coastal zone in that era. Cox's research indicates that Cun Hu Hill had straight ramparts, rather than curved as Smith's stylised plan shows them, although Smith's drawing is retained for illustration purposes here; the position of Cun Hu Hill is also very slightly adjusted from Smith's plan, as per Cox. 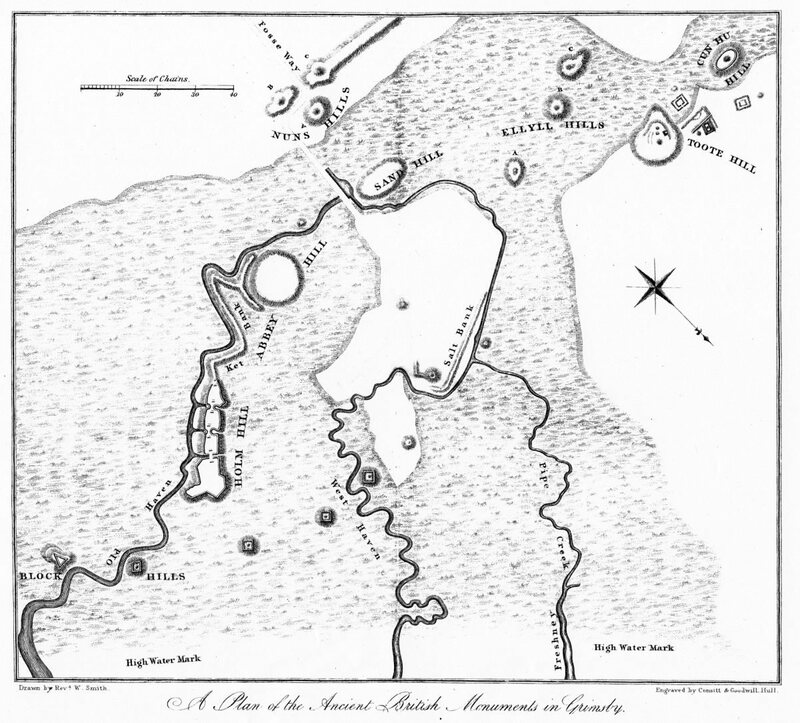 The scale included on Smith's 1825 plan was used to adjust the features to their correct size on the modern map, with the proviso that this assumes that Smith was reasonably accurate in his drafting (Image created by C. R. Green. Contains Ordnance Survey data © Crown copyright and database right 2014). The content of this page, including any original illustrations, is Cop`yright © Caitlin R. Green, 2014, All Rights Reserved, and should not be used without permission. The pubs of Louth have often attracted attention from local historians, but when it comes to the question of which of them is the oldest, there's rarely any serious discussion: Ye Olde Whyte Swanne on Eastgate (or, simply, The White Swan, as it appears from the historical directories to have been usually called before the twentieth century) is usually crowned the uncontested winner of that title. Ye Olde Whyte Swanne, Eastgate, Louth. The sign on the side claims that it was established in 1612, although in reality this is the date of its first appearance in the written record, rather than when it was established. Photo © 2014 Google. There are, it has to be said, good reasons why this is the case, not least the fact that 'The Sign of the Swan' is first mentioned as a Louth inn in an archdeacon’s visitation of 1612 and the present building is believed to date from the seventeenth century. As such, the White Swan would seem to be clearly more ancient than its usual nearest competitor, the Wheatsheaf on Westgate, formerly 'the Sign of the Wheatsheaf' (as in 1764), which is said to have been founded in 1627 and whose oldest standing element is usually only assigned to the late seventeenth century. However, whether The White Swan is the only answer to the question of the oldest pub in Louth, as opposed to the usual one, is a rather more complicated question: to some degree it depends exactly what one actually means by 'the oldest pub in Louth'? If one means the pub that has existed longest in Louth in its current premises, then The White Swan/Ye Olde Whyte Swanne is probably the answer that is sought: the White Swan clearly fits this bill. However, if one means something else, then there are other candidates to be had! The Greyhound Inn, Upgate, Louth. Photo © 2014 Google. The first candidate is the Greyhound Inn, on Upgate. This inn is first mentioned by name in 1767, had previously traded as the White Hart from at least 1751 to 1766, and was the site of several interesting incidents reported in the early newspapers—for example, in 1833 the landlord of the Greyhound, Joseph Wilson, was ‘removing a great coat belonging to one of his guests’ when ‘a loaded pistol, which was in one of the pockets, went off, and he received the contents in his body, from the effects of which he died almost immediately’ (Hull Packet, 6 Dec 1833). Clearly, it doesn't have the written pedigree to convincingly challenge the White Swan as the pub that has existed longest in Louth in its current premises. However, if one wishes to know the site of the oldest possible inn or pub yet identified in Louth, excluding the requirement that it be continuously operating, then the Greyhound might well be the answer. The reason for this lies with archaeological excavations that were undertaken to the rear of the Greyhound Inn around ten years ago. As was noted in Streets of Louth, these excavations indicated that this area of Louth was occupied from the twelfth century onwards and that it lay on the edge of the medieval town, with arable fields and wooded areas being located close by. Finds made include a substantial quantity of twelfth- and thirteenth-century pottery, along with horse shoes and horse harness fittings, leading to the suggestion that the first buildings on this site were stables that were perhaps associated with an inn. This site continued in use for a period but appears to have been largely abandoned after the mid-fourteenth century, perhaps because of the Black Death, and was only reoccupied in the eighteenth century. The location of the main inns and pubs mentioned in this past, against Bayley's 1834 plan of Louth; click the image for a larger version. 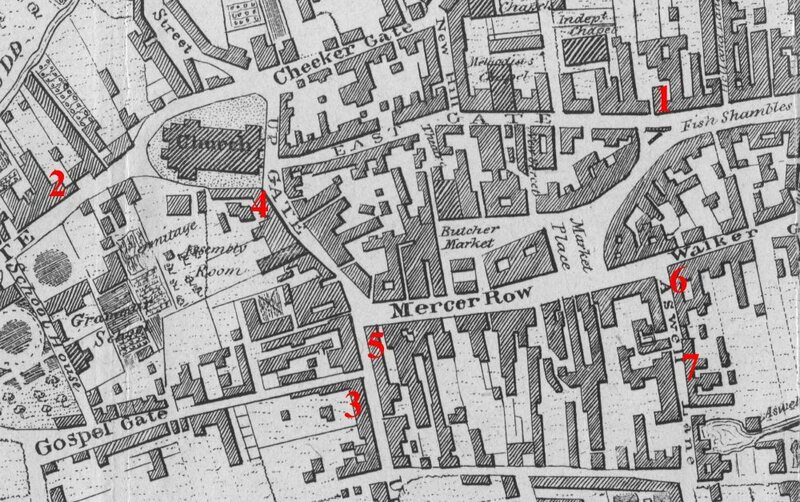 Key: 1=The White Swan; 2=The Wheatsheaf; 3=The Greyhound Inn; 4='Ye Inne'; 5=The Blue Stone Inn; 6=The Turks Head; 7=The Blackmoor's Head (Image created by C. R. Green, using R. S. Bayley's 1834 plan of Louth). If the Greyhound Inn therefore could be on the site of the oldest pub/inn yet identified in Louth, what of the oldest continuously operating pub or inn in the town, irrespective of the age of its current premises, another valid and important interpretation of the question 'which is the oldest pub in Louth?' It would be easy to assume that this would be the White Swan on Eastgate again, as it is first recorded in 1612 and appears to have operated continuously. However, there are several pubs or inns that were recorded earlier than this in the town, such as 'Ye Inne' that was located on Upgate in 1564—possibly on the site of the property to the south of Church House—or the Blue Stone Inn, which was located on the southern corner of Upgate and Mercer Row and was certainly functioning as an inn in 1677 and may well have been so in the sixteenth century too (it was said to have once extended back all the way to Kidgate and to have been the largest inn in the county until its closure in 1800: see Streets of Louth under Upgate for both of these inns). Even more importantly, one of these ancient inns may well be still operating today, albeit in a building much younger than the business itself. The inn in question was known as the Saracen's Head and was located on Aswell Lane (now Aswell Street). This inn bore a classically medieval inn-name, referencing the Crusades, and was indeed first mentioned in the medieval period, in John Louth's will of 1459. In October 1536, it made another appearance in the surviving documentary record: it was in the Saracen's Head that John Franke or Frankishe, the Registrar of the Bishop, was apparently staying ahead of the Visitation of Louth in that month, and it was from there that he was dragged with his books into the Market Place by Nicholas Melton (‘Captain Cobbler’) and his company at the start of the short-lived Lincolnshire Rising. The Turks Head, Aswell Street, Louth, arguably the site of the oldest continuously operating inn/pub in Louth. Although the current buildings belong to the modern era, the Turks Head likely continues the ancient Saracen's Head inn, which operated on Aswell Street in the medieval and early modern periods. Photo © 2014 Google. With regard to the location and potential survival of the Saracen’s Head into the modern period, it seems reasonable to suggest that there is probably some sort of intimate relationship between the medieval and early modern Saracen's Head inn on Aswell Lane and the modern Turks Head inn, which stands on the north-eastern corner of Aswell Street. The Turks Head appears to be one of the few Louth inns and public houses to have survived since the eighteenth century without a name change—a characteristic it also shares, incidentally, with the Wheatsheaf and the White Swan—and it was clearly already a significant inn during the mid-eighteenth century, when Christian Frederick Esberger stayed at the ‘Turkshead’ three times in 1764. In light of the relatively early recording of the Turks Head (most Louth inns and pubs are not recorded until the last part of the eighteenth century or after); the stability of the inn’s name; the close resemblance of this name to that of the Saracen’s Head ("Turk's Head", as an inn-name, is usually considered an eighteenth-century variant of the medieval "Saracen's Head"); and the location of the inn on the corner of Aswell Lane at the front of the medieval tenement that originally occupied the whole of east side of Aswell Lane from Queen Street (then Walkergate) to the Aswell spring, it certainly seems credible that the modern Turks Head might represent a rebuilding and survival of the medieval and early modern Saracen's Head. An alternative theory, promoted by R. W. Goulding a century ago, is that the now-demolished inn that once stood just a little further south on the same side of the Aswell Lane, where the Mr Chips’ takeaway now is, could have been a survival of the Saracen’s Head. Named variously the Red Lion, the White Hart and the Foresters’ Arms in the nineteenth and twentieth centuries, it was apparently known as the Blackmoor’s, or Black’s, Head before 1789, this being another eighteenth-century variant of the early "Saracen's Head" inn-name. Whilst it is certainly not impossible that this represents a continuing Saracen's Head, the lack of stability in the inn's name is noteworthy and the Turks Head looks like a more credible candidate if we have to choose. However, it is perhaps worth asking whether we really have to choose between these two inns at all. A better solution to the presence of two inns on the same side of Aswell Lane bearing names that are variants of the "Saracen's Head" is simply that the original medieval inn probably occupied the entirety of the medieval tenement here, from Queen Street to the Aswell spring (as the early Blue Stone Inn on Upgate/Mercer Row appears to have done too, see above), with both eighteenth-century inns then deriving from the original inn as its site was subdivided over time. After all, the current properties and businesses on both sides of Aswell Street all result from the subdivision of the two medieval tenements that the original Aswell Lane ran between, and such a scenario offers a plausible solution to the presence of both the Turks Head and the Blackmoor's Head on the same side of the road here—the Turks Head would, on this model, be the direct descendant of the medieval and early modern Saracen's Head inn, as it stands at the front of the original medieval tenement, whilst the Blackmoor's Head would be a secondary creation made at some subsequent point when the Saracen's Head tenement was split to create the properties facing onto Aswell Lane/Aswell Street. 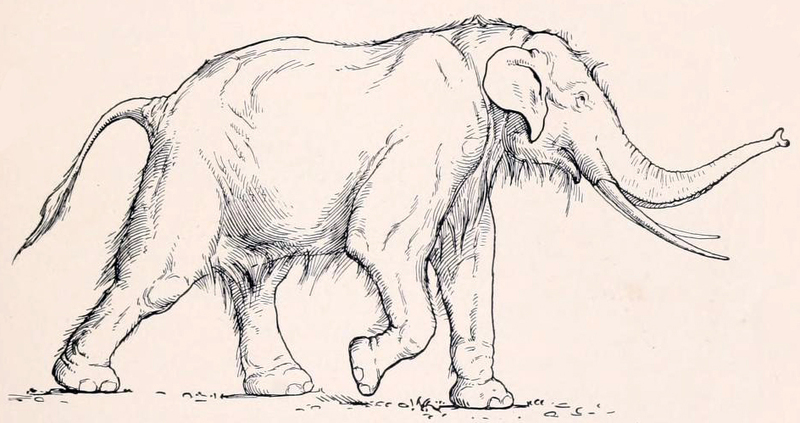 A quick post to supplement Saturday's one on the landscape evolution of eastern Lincolnshire. The following map gives a broader idea of what Lincolnshire and the surrounding region looked like about 17,000 years ago, when the glaciers of the last 'Ice Age' reached here (a topic I'll return to in more detail in the next post in my 'Brief History of the Louth Region' series). The present-day coastline is shown as a grey line; areas covered by the ice sheet are in white, areas covered by probable or possible glacial lakes are in blue, and ice- and water-free land is in green. The map was initially created for and published in my book The Origins of Louth: Archaeology and History in East Lincolnshire, 400,000 BC–AD 1086, but is presented here in colour. 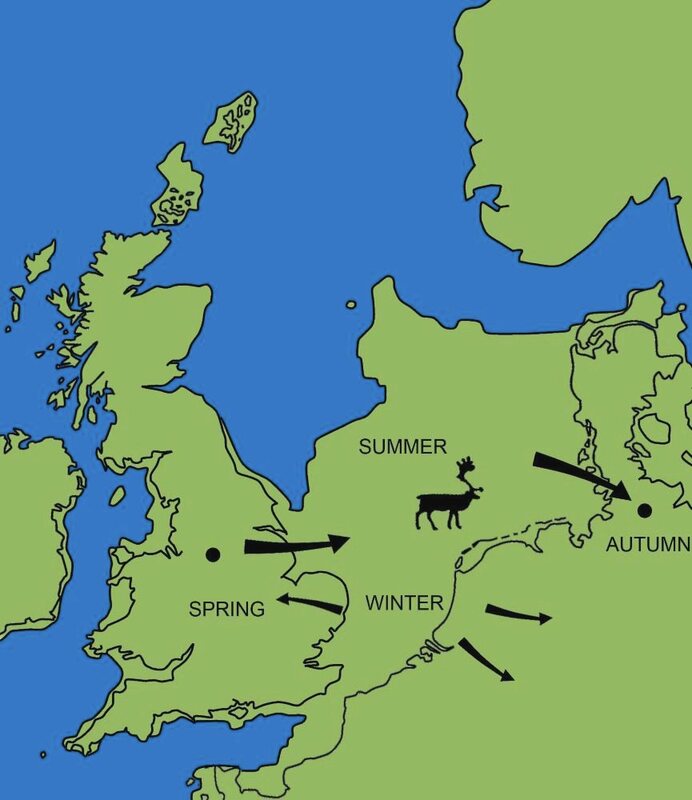 Lincolnshire and the surrounding region about 17,000 years ago (drawn by C. R. Green for Origins of Louth and based on Clark et al, 2004). 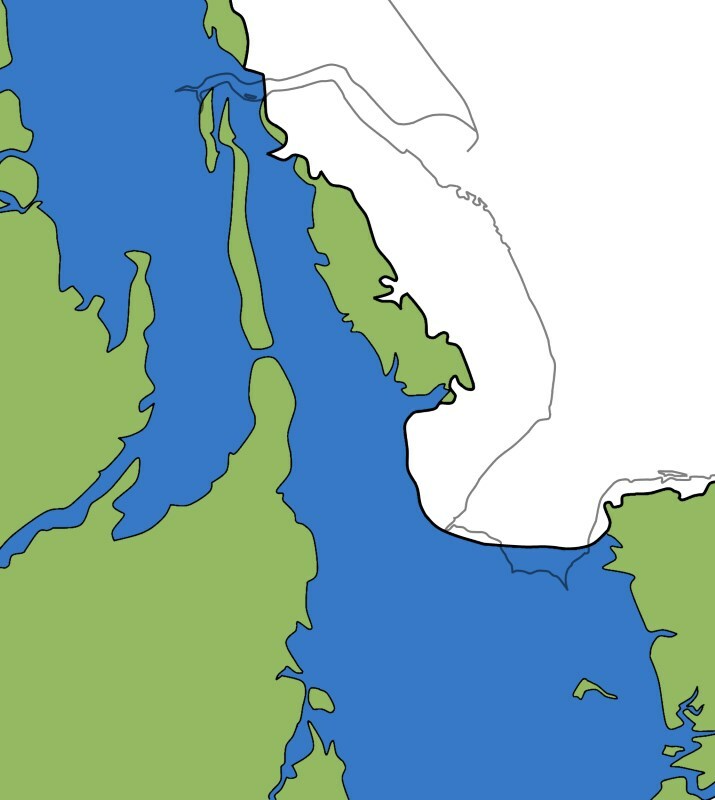 The present-day coastline is shown as a grey line; areas covered by the ice sheet are in white, areas covered by probable or possible glacial lakes are in blue, and ice- and water-free land is in green. 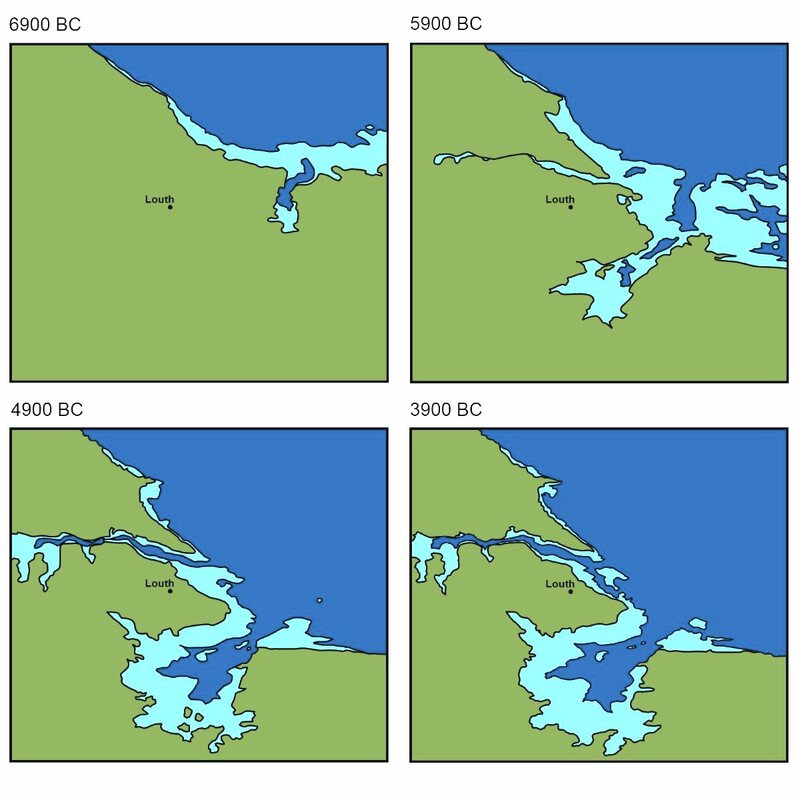 It should be noted that the large glacial lake to the south of the Wash is speculative and its existence has been disputed. 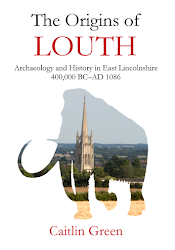 'The History of the Louth Region' is intended to offer an illustrated, up-to-date online history of the early Louth region, based in part on my book The Origins of Louth: Archaeology and History in East Lincolnshire, 400,000 BC–AD 1086. The 'Louth region' as defined here, showing areas lying within 5 and 10 km of the centre of Louth (created by C. R. Green, contains Ordnance Survey data © Crown copyright and database right 2011). 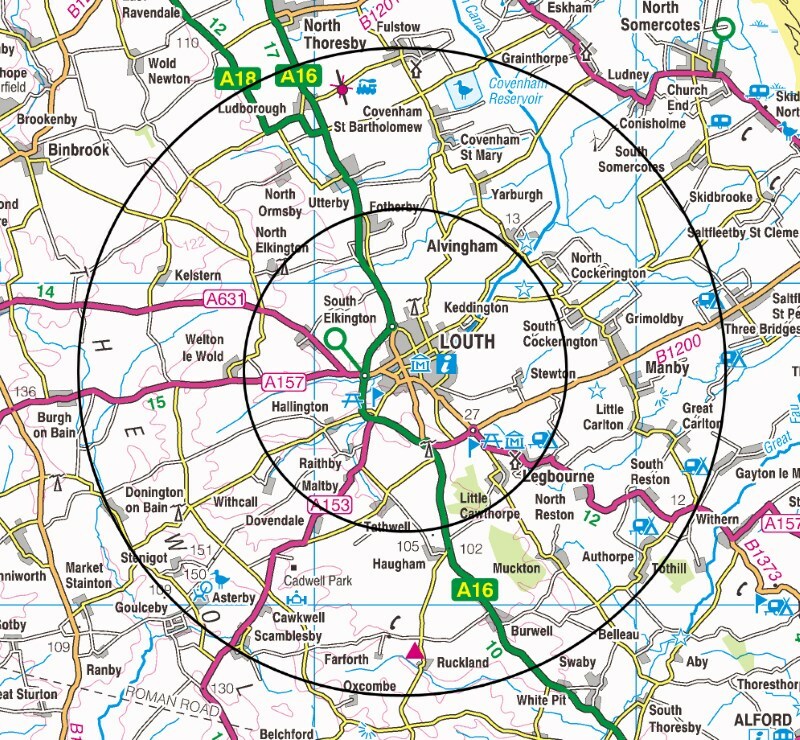 The 10 km radius study zone around Louth covers a sizeable area of both the Wolds and the Lincolnshire Marsh. It was chosen not only for this reason, but also in order to pull together enough material for a meaningful analysis and to enable Louth’s development to be placed within its local context. There are, needless to say, many books, websites, Facebook groups and the like which are devoted to the history of Louth and its surrounding villages. 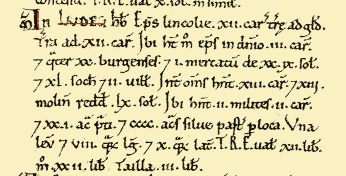 However, most of these are focussed on the nineteenth and twentieth centuries, with very little often said about earlier periods, especially those before the compilation of Domesday Book in 1086. To a large degree this is understandable, given that so little surviving written documentation survives from before the time of Domesday, less than a thousand years ago, and that so much information is preserved and accessible about the last century or so. Nonetheless, this situation is also problematical. First, humans have been active in the area around Louth for considerably longer than a thousand years. The earliest material yet found in Louth itself dates from the Later Mesolithic and Neolithic periods (7000 BC–2200 BC), and tools found only a little way from the town (at Welton le Wold) were made by humans who lived there hundreds of thousands of years ago. In other words, the documentary record covers only a small fragment of the actual human history of this part of Lincolnshire. Second, it seems clear that the fundamental origins of the medieval and modern Louth region lie beyond this documentary horizon. Louth was already a market town by the time of Domesday Book and most of the surrounding villages were in existence before this point too. In consequence, if we are interested in how the modern Louth region came into being, then we need to be looking at what happened in the period before written records become common. All pre-Norman archaeological finds & sites within the Louth region through to 2010, demonstrating the wealth of archaeological evidence available from the region (drawn by C. R. Green). 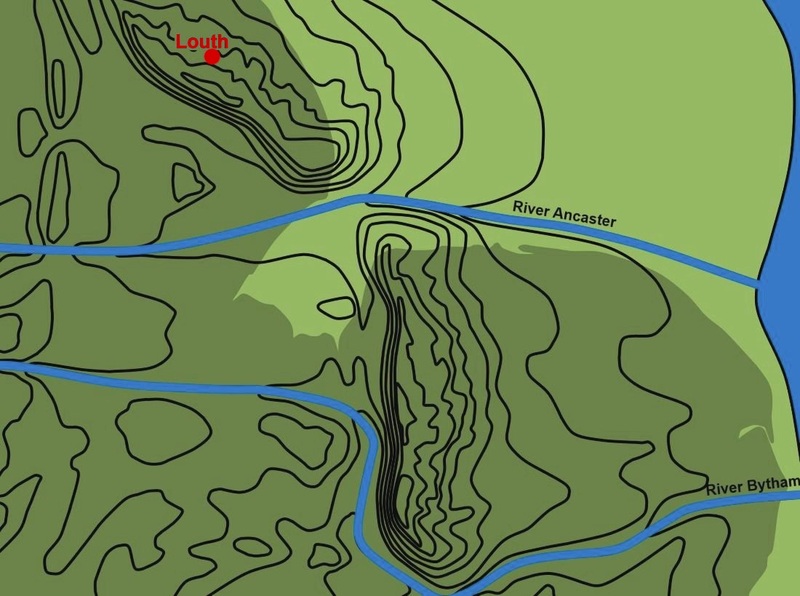 The finds are shown against an outline of the topography of the Wolds, the approximate position of the Late Saxon coastline, the original course of the River Lud and probable early routeways. 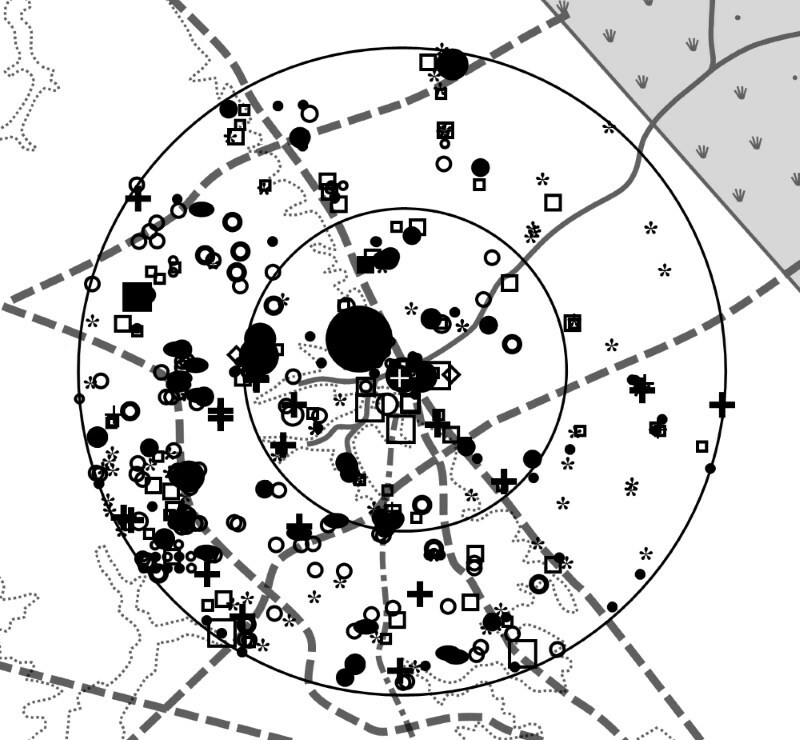 Maps like this can be read against the main 'Louth region' map, above, to get an idea of the location of the finds (the modern day details are not included on such maps, as they quickly become confusing with it). These two observations form the starting point for this series of posts. Any reasonable attempt at understanding the true length and complexity of human history and activity in the Louth region, how it changed over time, and how the modern region came into being, has to go beyond the documentary record. And whilst written references are certainly rare before the Norman Conquest, other types of evidence are available and even fairly plentiful. 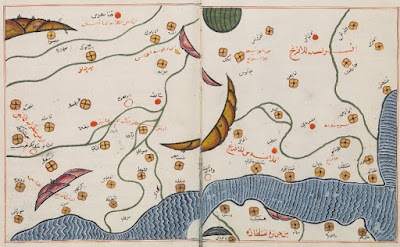 For example, there is a great wealth of archaeological material in this region (see the map above), and this can be supplemented by a significant body of linguistic, environmental, landscape and geological evidence too. Together these sources of evidence can be used to investigate the early history and origins of Louth and its hinterland, despite the lack of significant early written material. The aim of the present series is thus simple: to look at all the evidence, piece by piece, and ask what it can tell us about the history of the Louth region from the start of human activity here through into medieval period. In doing so, I hope to not only be able to build up an outline history of the Louth region from the Lower Palaeolithic onwards, but also to be able to draw wider attention to some of the fascinating finds and sites that lie within this region. I hope you enjoy! Welcome to my new personal website. 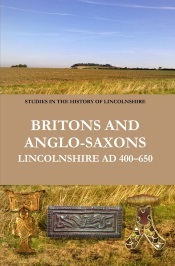 One of the first features will be 'A Brief History of the Louth Region in 100 Objects & Sites', starting later today, which is based on my book The Origins of Louth: Archaeology and History in East Lincolnshire, 400,000 BC–AD 1086. 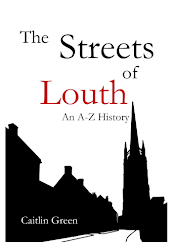 Note, I may adjust the number of objects and sites in the title of this series of posts, depending on how it goes, but the aim is to produce an illustrated, fairly easy-to-read, brief and up-to-date online history of the Louth region for the general reader! I also aim to post a variety of other materials alongside this feature. For further details of the intent and general coverage of this website, please see the 'About' page. The site is launching properly tomorrow and will build up content over time, though the bare bones are up and functioning now, so feel free to have a look around! Incidentally, both of my books on the Louth area have recently been reissued in paperback—please click on the images to the right if you want more details or to order a copy!